The B-Alert X10 Wireless EEG system is an ideal platform for adding neuroscience to any study in real-world or simulated environments. The system includes two sensor strips (1 small, 1 medium) that apply all sensors simultaneously for fast set-ups with coverage of the brain’s executive functions (prefrontal cortex), motor control (motor-strip), and visual system activity (parietal region). Combined with the independently validated Cognitive State Metrics and Cognitive Workload Metrics that generalize across environments, first-time and experienced EEG researchers alike are provided turn-key analysis tools to enhance the likelihood of meaningful findings in their work. 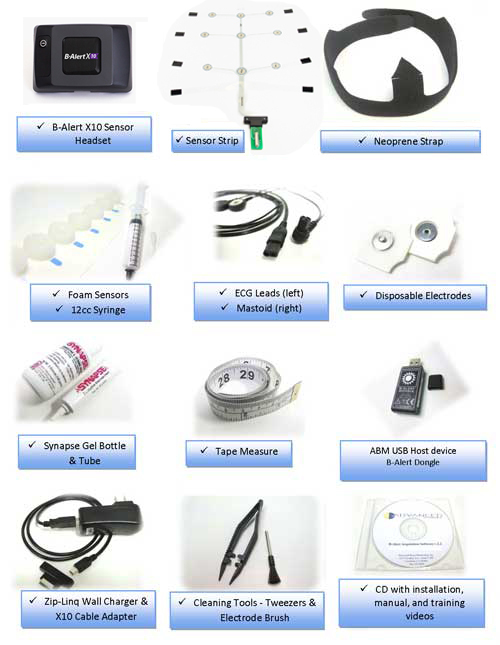 These state-of-the-art mobile, versatile and easy-to-use wireless EEG systems and software are enabling technologies for acquisition and interpretation of physiological signals across a wide variety of real-world applications and are used researchers for a wide range of neuroscience research. The lightweight headset applies easily and remains comfortable for extended high-quality recordings in any home, lab, or operational setting. 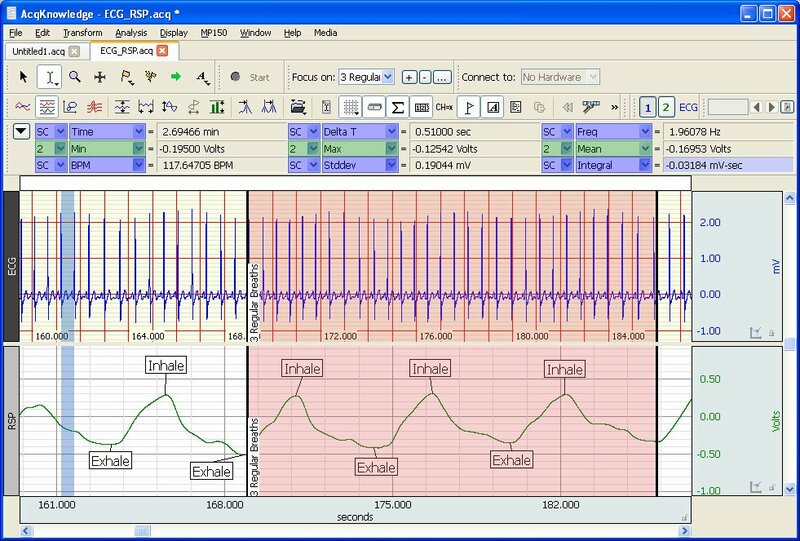 The 9-channel combination of mid-line and lateral EEG sites—plus the additional channel of ECG, EMG, or EOG data—allows for multiple analysis opportunities, as evidenced by numerous peer-reviewed publications (see citations link below). 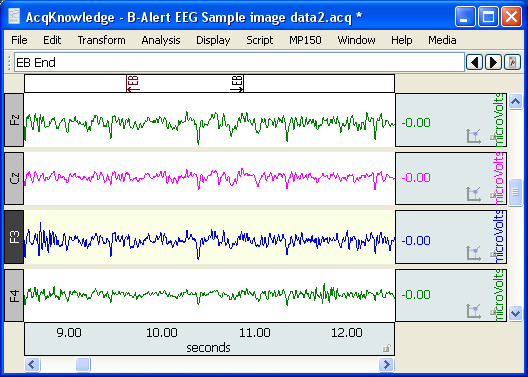 If the cognitive states metrics are also part of the B-Alert system, they are recorded by AcqKnowledge as on-line calculation channels for further analysis. Real-time subject classifications for engagement, confusion/distraction, drowsiness, workload, and stress are displayed with the raw EEG, plus any other physiological signals such as respiration, ECG, electrodermal activity (EDA), and temperature, etc. All the data is synchronized and accessible from within AcqKnowledge and the signals are available for further analysis. 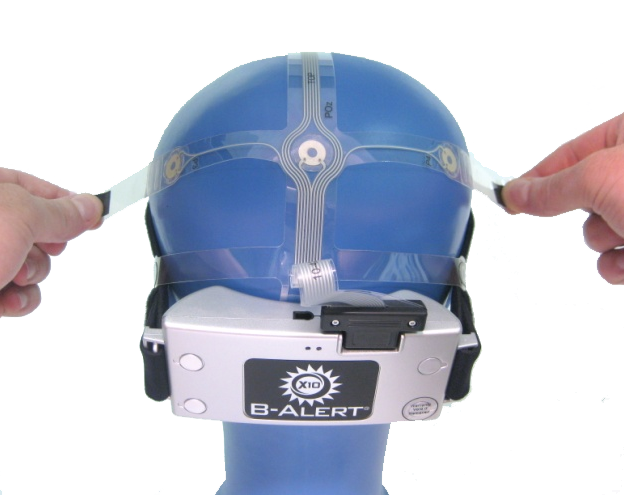 The B-Alert X10 mobile-wireless EEG system delivers real-time measurements for a variety of research and engineering applications, including closed-loop performance monitoring and simulation training; HCI design assessment; situational awareness and team dynamics monitoring; tools for productivity and training enhancement; and fatigue management. The B-Alert X10 is a platform for collecting the data valuable to improve the human computer interface, accelerate trainee learning, manage fatigue within the operational space, etc. Its headset design features semi-dry, soft-sensor strips which minimize required technician training and keep standard set-up time to less than five minutes. 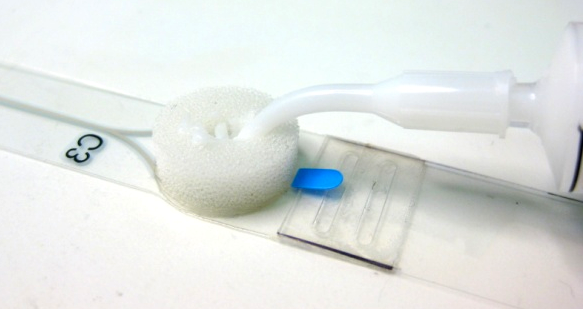 The soft-sensor systems are compact, low-profile and comfortable enough to wear for 8+ hour sessions. They can be easily integrated into existing equipment as evidenced by a recent study where a 32-member National Guard platoon wore the systems fully-integrated under Kevlar helmets out in the field during extended sleep deprivation studies. The system includes an AcqKnowledge license for data acquisition and analysis. Use as a stand-alone EEG system or integrate with powerful BIOPAC MP Systems for more complete physiological response studies. B-Alert data is synchronized with MP System data and automatically merged into one file following data acquisition. After over eight years of refined and focused research, the B-Alert decontamination and classification software specifies data into proprietary metrics of fatigue, stress, confusion, engagement and workload in real-time. The GUI intuitively represents both the raw and processed data for easy understanding by even the untrained user. Each X10 requires its own computer, and a max of six (6) headsets can be used in the same room. Add B-Alert Analysis software for cognitive state metrics. AcqKnowledge is an intuitive, interactive program that lets you instantly view, measure, transform, and analyze data. Perform complex data acquisition, stimulation, triggering, and automated analysis routines using simple pull-down menus and dialogs—no need to learn a programming language or new protocol. Online analysis settings, filters, and transformations provide real-time feedback, or you can choose from a wide variety of off-line analysis tools. Multiple display options are available during and after acquisition—just click on an icon to flip between Chart, Scope, X/Y, Overlapped segments, Histogram, or FFT. The software also includes quality presentation capabilities.